For high-performance vehicles we have developed a 4x4 tyre that also performs well at high road speeds. 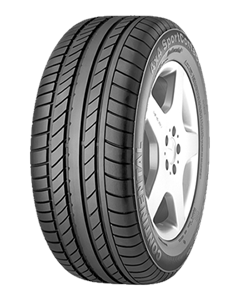 Its asymmetrical tread pattern with the compact outer shoulder area provides for cornering stability. Wide tread grooves divert the water and protect against aquaplaning. The tread blocks are staggered for a quiet and comfortable ride. Good cornering stability through asymmetric tread pattern. Suitable for high-speed road use. Excellent comfort and noise levels. Trusted by leading car manufacturers; Porsche Cayenne and VW Touareg come equipped with Conti4x4SportContact from the factory.